Some time ago, when googling for Picasa information, I came across a site called www.Geeksontour.com. Half suspecting I’d found a rock band instead of an instructional material, I was pleased to discover that the Geeks on Tour are Jim and Chris Guld. They zigzag across the country in a motor home, teaching RVers to manage their computers, GPS equipment, wifi connections and use of Picasa to handle the zillions of digital photographs they’re all taking. And the book? 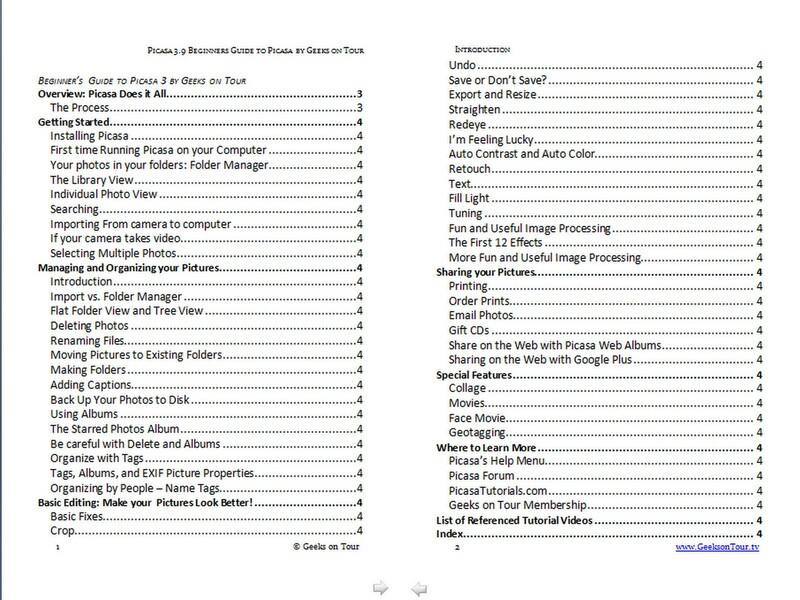 It’s a delightful, invaluable guide to using Picasa. It’s small—5½”x11”, with 59 pages of clear instructions that take you from an overview of Picasa’s features and capabilities, through details of each step to use the program, to sharing and backing up the finished products after you download photos from your camera and work on them. Chris Guld makes her points in a few succinct words. Nothing is overwritten, and nothing seems to be missing technically. The author’s style is conversational and understandable. The videos are outstanding and narrated by Chris Guld, who shows every stroke of the process at hand and goes slowly enough so you can follow and take notes, but not so slow as to be boring. The 25 videos each run from a little over five minutes up to 22 minutes. I was anxiously awaiting delivery of this guide. When I opened the package and saw an unimpressive little paperback guide I was very disappointed and thought I had way overpaid. Then I sat down and read a few chapters. I discovered answers to questions about Picasa which were perplexing to me. The text is simple and straightforward and does the job. I began to value the guide despite its humble appearance. And then I started playing the lessons on te DVD. WOW! Clear and consise explanations. Everything is well organized and demontrated, Definitely for the beginner and yet I feel I am progressing daily toward mastery. This has been a wonderful boost for me in my photography class where most participants are far more experienced than I am. Now I feel this set of small handbook and DVD is a bargain. Small in size..Huge on content! Don’t let the size of this book fool you. It’s huge on information,easy to understand and very well layed out.The videos included are an added bonus and worth the cost of the book alone. For anyone who is new to Picasa,this is the ultimate guide. Can I buy your book in sterling for my kindle? Please tell me what it costsin £££s. I wish to have the electroic form of the Piccasa Version 3 (revised) on my computer, but what is the amount equilivent to in India Currency? and how can I send this amount? I tried to order the Picasa Book and Disk but the final page never cleared and just sat there. Please let me know whether it went through as I will have to cancel through Visa if there is a problem. Dittoes to Susie and Connie. How can I get the upgrade? Just print…no DVD. Thanks. Best Regards Mick Hester . Spain . I bought and have an old version of Beginner’s Guide to Picasa 3. How can I upgrade it to the 3.9 or just buy the new version? My question also. How can I upgrade from 3 to 3.9 and is there a reason to upgrade. I have been trying to eliminate duplicate photos in Picasa that got in there before I knew what I was doing with Picasa. When I go to delete a selected photo, a box comes up and informs me that if you delete this photo that that particular photo will be deleted in all other albums 🙁 Is there anyway around this??? It’s important to understand the difference between folders and albums. Folders are where the pictures are actually stored, Albums are just listings/categories/pointers. Think of music playlists – that’s what albums are. The message is telling you that if you delete a picture from the folder where it’s stored, it will, of necessity, be removed from any Album where it is listed. Make sense? I do not have a kindle but I do have a kindle app on my IPad. How do I go about getting the Picasa book on my kindle app. The Kindle App on your iPad is just as good as having the Kindle. Just go to the Amazon Kindle store and purchase it. Configure your Kindle app with your account login and password, and you can read whatever books you purchased.